The good news is wedding rings typically have a much lower price point than the engagement ring. While you can go crazy with embellishments, which will cost you, you can also keep your overall wedding expenses down by shopping at the right time for your wedding bands. As we mentioned in our post on the best time to buy jewelry, the optimal shopping periods to buy are March, late May, July and August. Reasoning? Read on to find out why. The dust has settled from the Christmas, New Year’s, and Valentine’s Day shopping madness. And the consumers who are less savvy than you are left with empty wallets and a mountain of outstanding debt. This is to your advantage, as jewelers will be scrambling in their half-empty stores to find creative ways to boost sales. Here is your opportunity to seal a great deal on set of wedding bands. This is another window of opportunity when you could hear of some great sales. This is around when taxpayers will be receiving their refund checks from Uncle Sam, and retailers will bring out their discount posters. Sales dip once again around late summer when back-to-school shopping and last-minute vacations roll around. And you know what that means for jewelers: decreased demand and more bargains for you, ranging from 15 to 40 percent off. Timing isn’t everything, although it does have a big impact on the final price you’ll see on your receipt. There are some other things you can do to keep the price of your wedding rings down – and keep any savings for other aspects of your wedding. 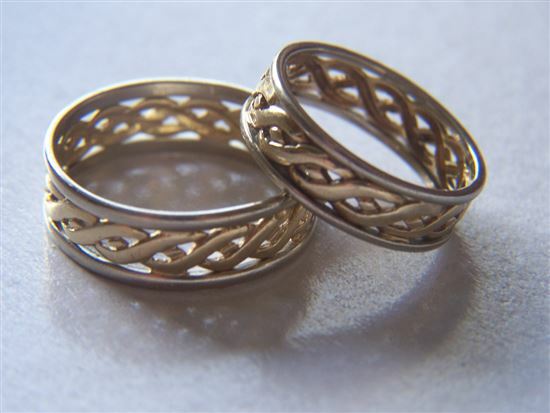 Wedding bands can range from around $100 for a solid gold band to thousands for those that are encrusted with diamonds. Think about how much you can and should realistically spend to avoid falling in love with an overly expensive ring that you can’t afford, and to avoid being taken in by a savvy salesperson. Another reason to rein in your budget: you’ve likely already spent a substantial amount of cash on other wedding expenses (or you will soon). Anywhere you can cut down the amount of debt you’ll be taking on will be setting your marriage off on the right start. Why not give Amazon, IDoNowIDont.com, or Overstock.com a shot? These websites have decent wedding ring stock and offer savings of between 20 and 70 percent off what you would find in a brick-and-mortar location. Just be sure you fully understand the return policy before ordering. For example, will you have to pay for shipping? Is there a tight window for returns? Sales representatives naturally want you to spend as much with them as possible to help them meet their sales targets. While a pushy salesperson can be annoying, you can actually use this to your advantage. You have buyer power if you need additional items, such as earrings for the mother of the bride or small pendants for the bridesmaids, and could get a good deal. You may desire platinum wedding bands, but gold-plated and sterling silver options are much more cost efficient. Besides, you can always upgrade later on, when you are more likely to be earning a higher salary and you’re not spending so much of it on the wedding. The Internet can be a treasure trove of beautiful rings, but you can also find second-hand bands elsewhere and in person. Select retailers, such as Zales and Kay Jewelers, offer a host of second-hand wedding bands to choose from. Assuming you don’t intend to tie the knot immediately after the proposal, take your time when searching for a set of wedding band s. There are literally thousands to choose from, and it’s pointless to limit your options when it’s possible to save more on a set of bands that are more suitable for your lifestyle. There’s not a large profit margin with standard wedding bands, but throwing a reasonable dollar amount on the table for your sales representative to consider is worth a shot. And if the person won’t budge, feel free to take your business elsewhere. 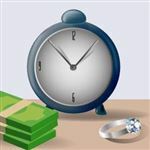 Share on Facebook "Best Time to Buy Wedding Rings"